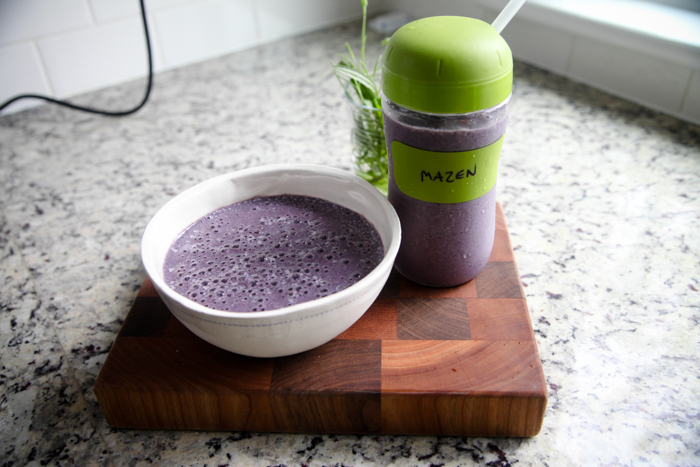 Smoothies are my number-one way to get Mazen to pack in some nutrients – and they have been since he starting eating real food! My child does not like berries (WHAT?! ), so this is really the only way I can get those good antioxidants into his little body. 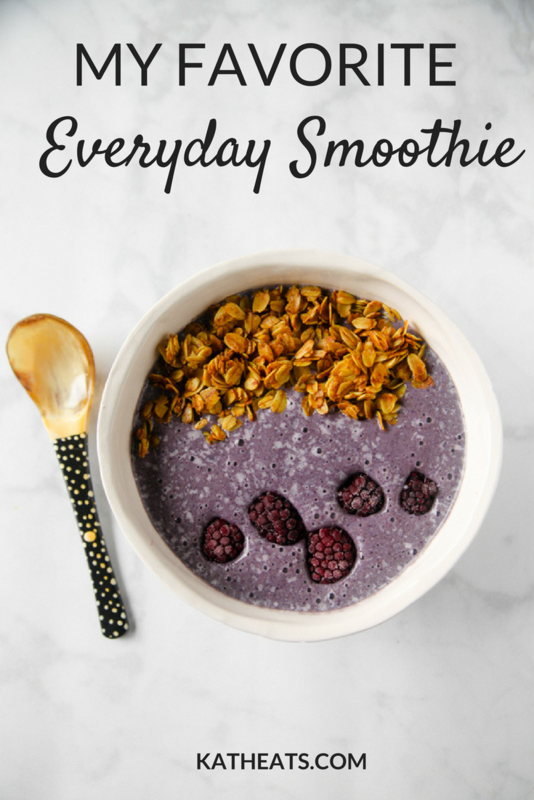 Thus, we enjoy smoothies at least a few times a week. 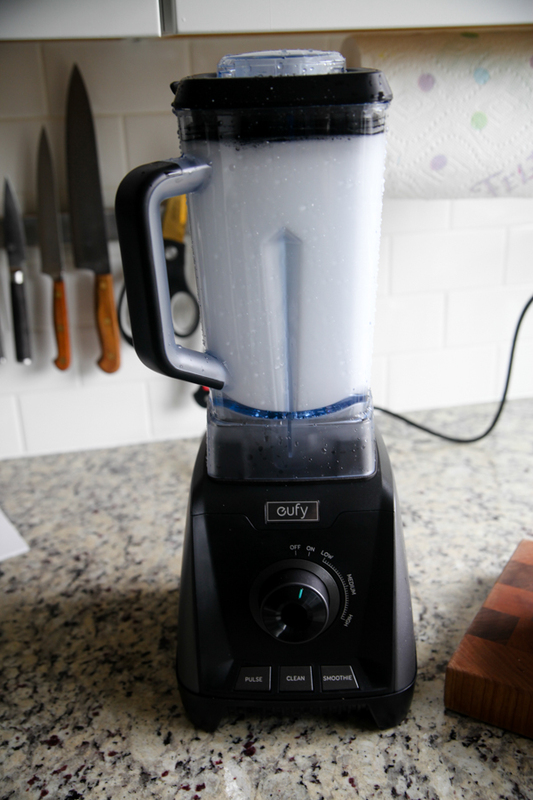 Eufy sent me their latest and greatest blender to review in a blog post. 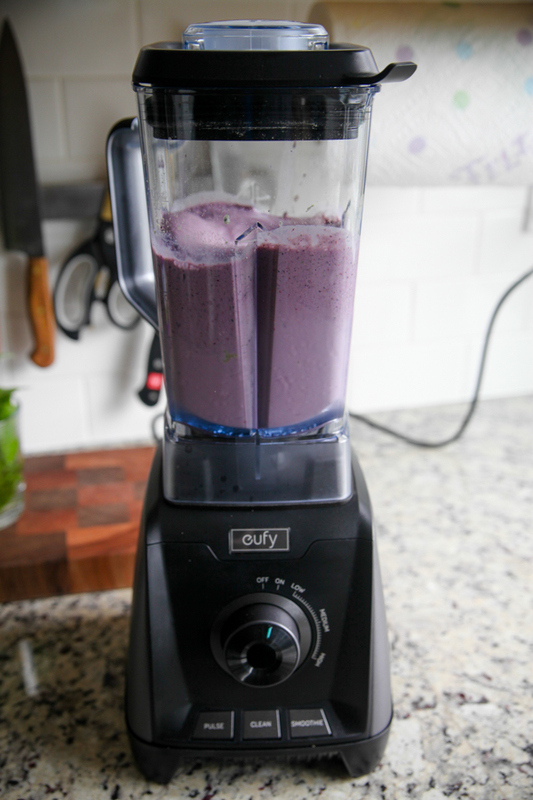 I’ve had a Vita-mix for about a decade now, and this Eufy blender rivals it to a T. For now, my Vita-mix is tucked away and we’ve been loving the Eufy for the past few weeks. It’s very lightweight, so dragging it out from its storage corner is a lot easier, as it rinsing it under the faucet. 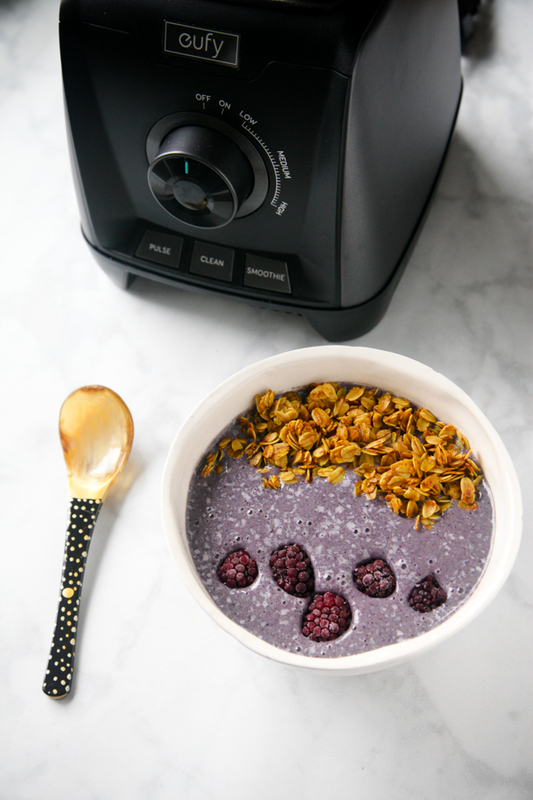 The Eufy has programmed buttons for “Cleaning” and “Smoothie” that do all kinds of fancy slow-to-fast movements to create the perfect result. The blender shuts off when it’s ready! In terms of consistency, it’s spot on! 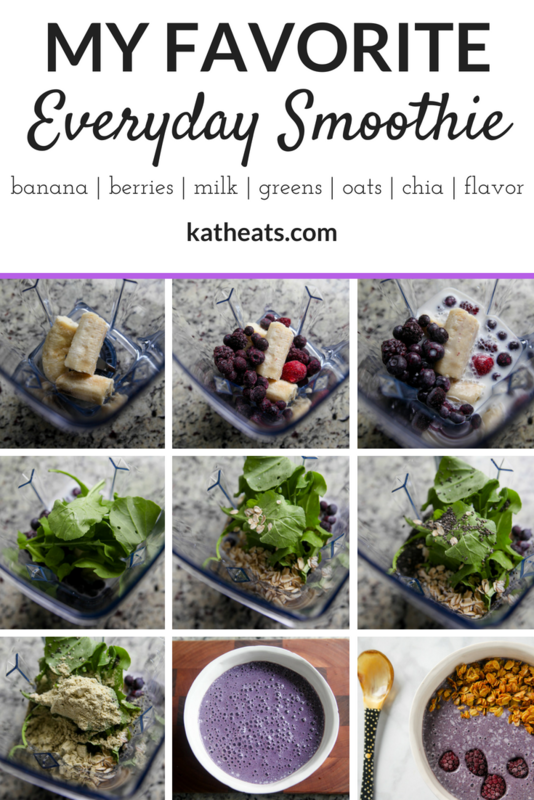 The best smoothies (in my opinion!) make a tornado vortex while blending and have little bubbles upon pouring. 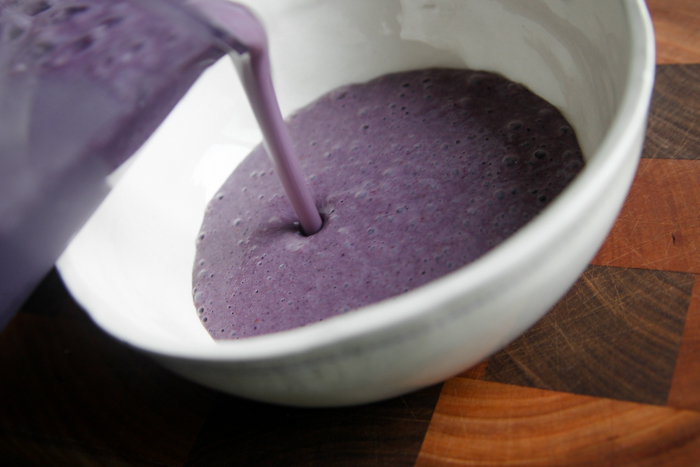 The consistency was perfect – smooth and silky! 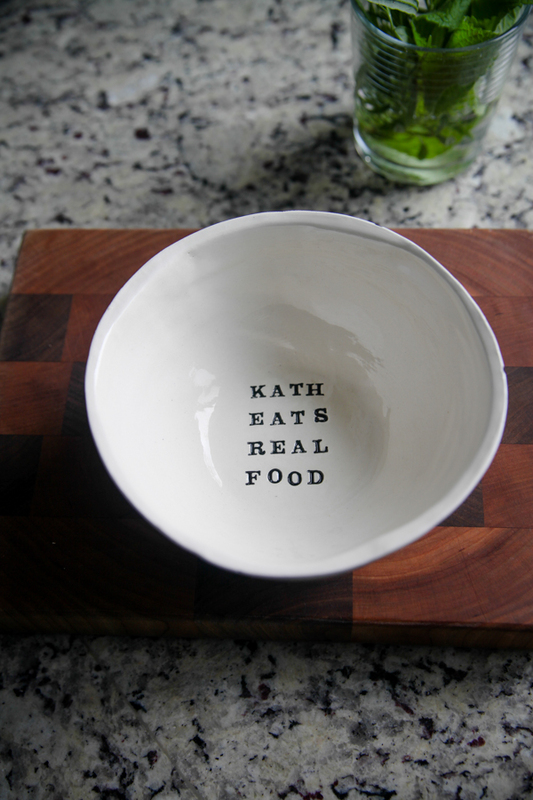 And in recipe form! Note the Vega Coconut Almond is entirely optional, but I love the flavor it brings. I dressed mine up with homemade granola (recipe TBD!) and a few frozen berries for garnish. 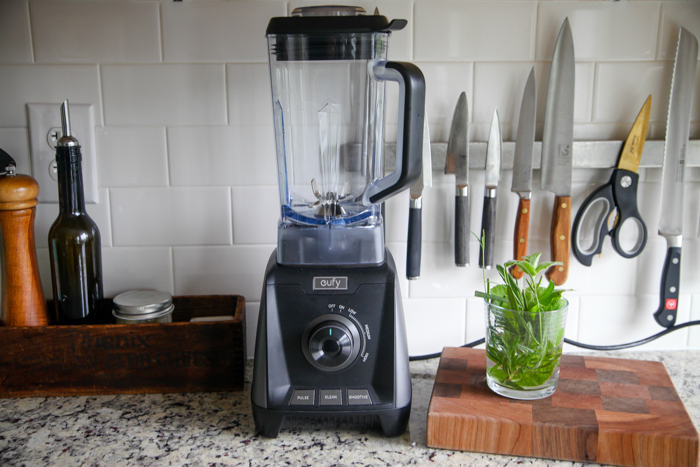 The Eufy blender retails for $129.99 but will be dropping to a $99 sale on Amazon over the weekend on Sunday and will remain on sale until the 24th! Thanks to Eufy for sponsoring this post. I love the visual recipe/chart of the smoothie!! This looks delicious! I am going to have to give this a whirl (or…a blend?) soon! True or false? 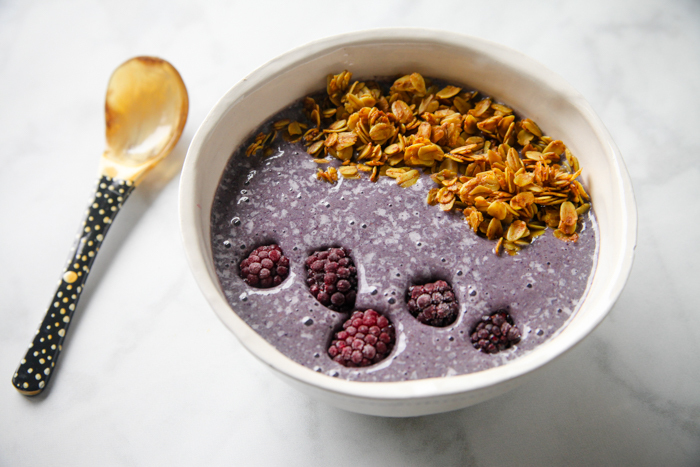 Smoothie lovers are usually acai Bowl lovers as well. I’ve never had this or my Vitamix leak. Could you be over filling it? So far I think the two are very comparable and this one even has a few extra pros like the dishwasher, easy open lid and quick buttons. I can’t speak for longevity. I don’t think so. It leaks at the base where the little suction piece is (on the motor side, like where you connect the motor and pitcher part). I may try this instead… see how it compares for a week or so! The price point is awesome. That is odd! I would say a defect. Thanks for the top on smoothie consistency! That’s helpful. Thanks so much for the link and recommendation for this blender. The price is so much more affordable than a VitaMix and with your review of how well it performs I may purchase one. 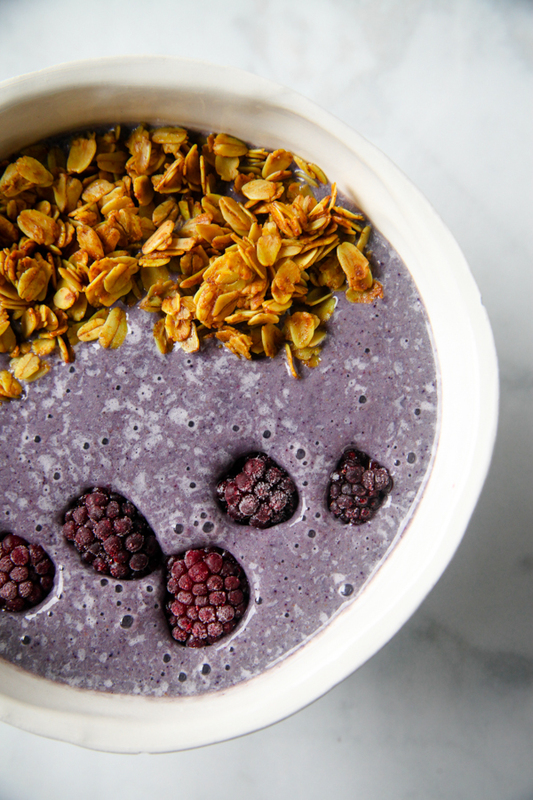 Your smoothie looks awesome. Thanks also for the note on the sale this weekend! 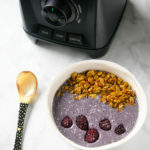 Rivals the Vitamix? awesome. And the price point is right. I happen to need a new blender and I think I’ll try this. I just checked and it’s not on sale yet?? I really want to purchase but would hate to miss out on the sale if it still might happen? It starts tomorrow – the 10th! And runs through the 24th. 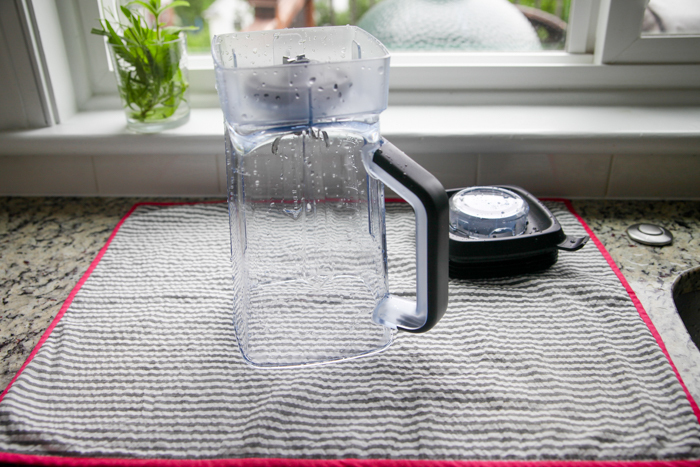 Random question but – where is the drying towel/mat you have the blender top on from? I love the stripes and the red border! You’ve got me sold on this smoothie, and I’ve been compare shopping ninjas for months- but I can’t pass up this deal on the Eufy! However it’s the 10th and the link still bring me to Amazon showing 129.00 There is a $15 coupon offered but that doesn’t bring it to your posted $99 sale price. Any idea why? Thank you! Oh weird. I will email my contact right away and should get a response first thing tomorrow. Since it’s supposed to be a two week sale hoping we have plenty of time to clear up. It might just be going live at midnight or something. I’ll report back! Just placed an order for an Eufy! Interesting! 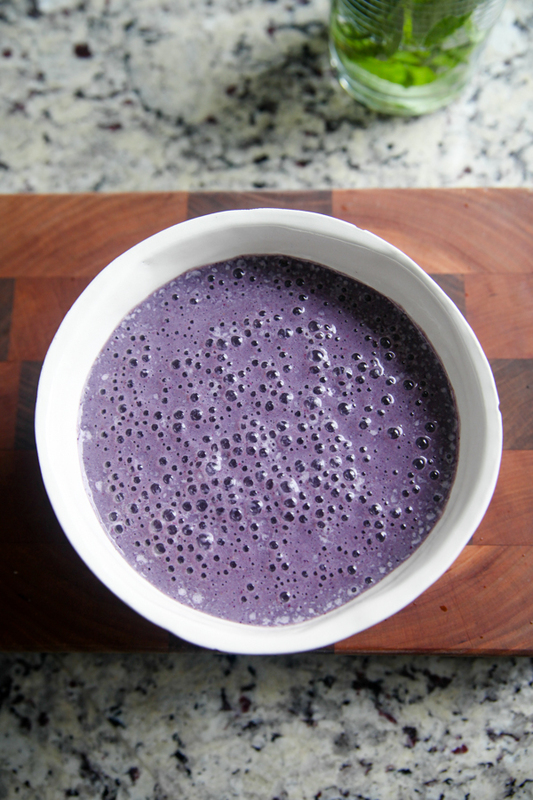 I had never heard of this blender before, my super old Vitamix could use a rival! I would use one with a decent amount of protein – probably soy.